I keep looking at all these fun novelty fabrics and I wanted to do SOMETHING with them. I spy quilt?? Didn't really satisfy my craving to have a project done in an hour. So.....I was thinking of a little quiet book for kids that's fun to look at. It's quiet, sneaky, incognito but best of all it's WASHABLE and the pages won't tear! So for the little spy in your family.................Here's how I did it. Look for interesting scenes and colors. For this size book, you want to make sure your novelty print isn’t too large. 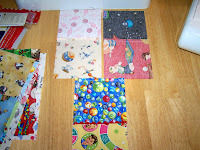 1) Choose two of your favorite squares that you would like to see on the front and back covers. Before sewing these 2 together, baste the 6" piece of medium RicRac on the left hand side of your front cover. 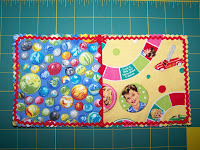 With right sides together, sew your front and back cover together. Trim just a bit of the seam allowance off, because of the bulk from the Ric Rac. Press seam open. You should see half of the Ric Rac showing on the right side now. 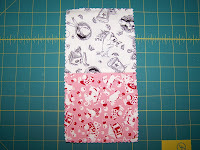 2)With the rest of your squares, sew them into pairs of 2. Hint: It’s okay to put like colors or subjects (like my letters and numbers) by each other, because once they get into the book form they will be separated. EXC EPT for your center page. This pair will be the only pair that will appear as you sewed them. You now have 10 sets of two. 3) Lay out your sets. Pair up a set of 2 with another set of two. Place them back to back with wrong sides together. Be sure to check that any directional fabric is facing the same way as what is on the back or vice versa. 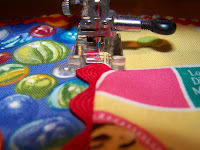 Matching your center seam allowances, sew 1/4" around the entire ‘rectangle. 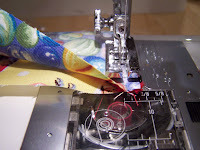 4) After your pairs are sewn together, rotary cut around the edge with a pinking blade or use any decorative shears that will go through fabric. Just take a little bit off the edge. Doesn’t have to be much. We’ve used a scalloped edge shear. 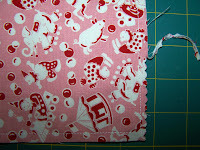 As this is a raw edge book, the pinking will help with fraying. If you don’t have any of the above, don’t panic. Your book will still be just fine. You’ll just be pulling off a few strands of thread for a while. Your book won’t disappear, it’ll be just fine! 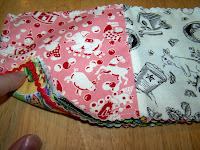 5) With your front/back cover set, sew on the small RicRac around the 1/4" sewn line. When you complete the rectangle with Ric Rac trim the Ric Rac to just match up with the starting place. Apply a drop of Fray Check to the edges of the cut Ric Rac. 6) It’s time to put your ‘book’ together! Lay the front/back covers face down on the table. Watch your direction. Layer the 4 other sets on top of this. The 2 prints you chose earlier to be by each other, will be your center pages. 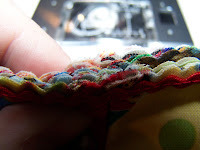 7) You will sew down the center of the book, through all thickness. Do the sewing o n the front/back covers on the Ric Rack. Match the color of your thread to the color of the Ric Rac so it’s not so noticeable. "Can you find a rabbit with a hat?" "I spy a purple spaceman! Can you find him?" Cute idea! I always have scraps of fabric that I just can't part with, but the thought of piecing another million square quilt together just doesn't always excite me. I've got kids that will totally love this little book-and I just recently discovered that I can print on muslin by taping it to a piece of paper and putting it into my printer. I can then add family pictures to this I spy book. Thanks for the inspiration. 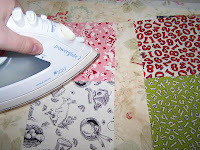 What a fab idea...I'm already searching for fabrics to make one for my little neice! This blog thingy is catching..I can feel one coming on!!! Where do you get your rick-rack from? I am so excited. I have made my boys pajamas for years and have always saved the scrapes. Now I know what to do with them. Awesome idea! 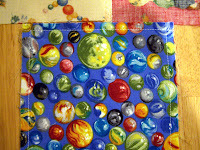 I've got a vast collection of future I Spy fabric and no real desire to piece them. My son would love this as a "car book"
Fabfuchsia, you're a winner! But I've yet to figure out how to contact you. 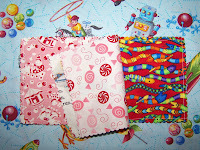 If you want to contact us at quilttaffy@fiberpipe.net we'll get you winnings in the mail asap! 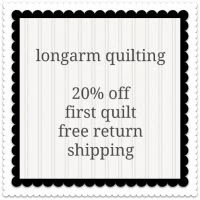 Check out the store for your choices. RicRac.......just went to Joann's and bought the 2 different sizes. I think the small one was on a cone instead of a little package. Hope to be carrying ricrac soon. What a fantastic idea. This a a great way to use up some of my novelty prints that I have laying around and had no clue what to do with them. Rick Rack just adds the finishing touch! Thanks for the idea! This is a Terrific idea. Just the thing to keep the toddler quiet in Church. This little soft book won't make noise. One toddler got the family car keys and when the keys hit the wooden pews you could hear it! I keep a small picture book in my purse and gave it to the little one and that occupied him for a while. I'm new to blogging too! What a super idea! I don't sew, but this is totally something I would have bought for car trips when my children were little. This looks like a great idea! My grandchildren will love it. 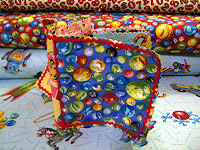 The younger ones can play with it without wrecking it and the older ones can search for items on the fabric. I look forward to making it. Thanks for the idea. 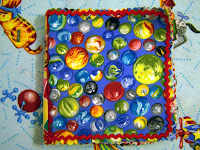 "Found" the page today (01/08/10)thru a message from Craft Stylish. Great idea! My thought, to firm & stabilize the cover, would be to use squares of quilting template sheet & thin layer of batting between the fabric squares. Thin batting between the "pages" would provide body. quick question...in your experience, was 20 blocks about the right quantity? 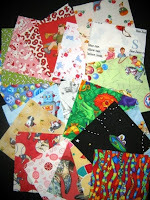 i have 36 squares that i was going to make into a quilt, but i just don't have it in me. plus, i love this book idea! i want to use all of my 36 squares, but wonder if it would be too think. thanks! erin: yeah, 36 might be too many. but you could just keep stacking them on top of each other until you think it won't sew through anymore?? or you could always hand sew it?? Good Luck. couldn't find an email for you so I'm commenting here.